So, you’ve been a diligent content marketer and you’re producing content – well done! But let’s take a step back and analyse what you plan to do with it. While content marketing is fast becoming one of the most powerful tools to use in your marketing mix, there are also a number of mistakes you can unintentionally make, which will devalue the quality of your digital marketing strategy. 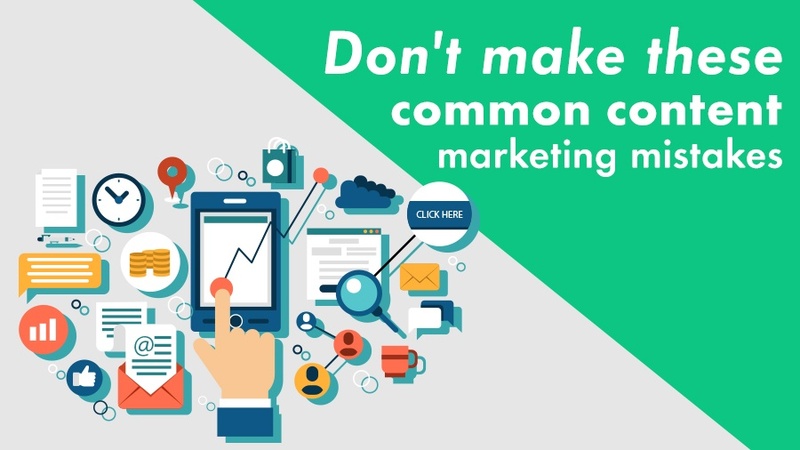 Let us take you through the most common content marketing mistakes we’ve seen, and how you can avoid them. Writers, or content producers, like most creatives, can often get caught up in the excitement of creating their content that they go full tilt without an actual plan in place. As exciting as it is to get started with a new campaign, unfortunately, you can’t begin without a plan and expect to see results. The golden rule is that if you want your content to be effective, you’ll need a well thought-out strategy to guide all your actions. Do some research. Find out who your target audience is, what their needs are and what they need and want to know. Use the tools available to you to research your audience. In Facebook Ads manager, you can actually assess your audience using the ‘’Audience Insights’’ tool. You can refine your audience by viewing their interests, page likes, etc. which will help to build a far better picture of who you are trying to reach. Research your competitors. How are they reaching your audience? Once you know what direction your content needs to go in, then you need to plan for the first 6 months and put a content calendar in place to ensure you remain on track (see point 6 further down in this blog). You must often hear the words, ‘less is more and quantity is better than quality’. Well this is true for your content production. The tricky balance you have to get right though is that you do need to have a steady stream of content in order to get that credibility and increase your followers. However, if your content is of poor quality it’s not going to be consumed anyway. Too many businesses are making the mistake of producing mediocre content. Not only is it a waste of time to the person producing it, but it is also damaging your credibility…. Each time a follower sees one of your mediocre pieces, they become less and less engaged, and eventually they’ll just ignore it and move on. Your focus needs to be on producing high-quality content first, and quantity once you’ve got the hang of it. Of course, when you hear the word content, you immediately think of writing, such as blogs. But content can take on so many forms; video, podcasts, infographics and so much more. Diversifying your method of getting your message across means you are going to appeal to all audiences. Some people love to read, in which case, blog is perfect for them. But you get other people who’ll only watch short videos. So if you really want your message to be heard, you need to make sure you’re covering all bases. Plus, if someone was following your page, or watching your website, they’d be impressed to see a wide array of mediums, rather than just the usual blog posts. It might seem risky to specialise your content so much – perhaps you think you’re excluding people? But specialised content is going to be far more valuable to your audience than general content. General content is only necessary if you don’t know who you’re writing to (but then, if you don’t know who you’re writing to, you need to be seriously concerned). Once you know who your audience is (and that’s top priority) you need to be giving them content that they need and want. 5. Content marketing is not a one-sided affair! So you’re into the swing of things and you’re producing content that your audiences needs and wants. But are you monitoring it? Are you checking the responses? Providing valuable content is a great first step, but it’s only the beginning of the dialogue. Once you’ve produced your content and put it out there, your job is only half done. It’s now time to interact with your readers and social media followers. Be sure to respond to comments on your blog, ‘like’ and reply to comments on Facebook and mentions on Twitter. If people are taking the effort to engage with you, the least you can do is send a reply back. A back and forth dialogue between you and your followers is what is going to keep the togs of your content machine turning. Content creation is so much more than just producing content. You have to be regular. If you are only posting once in a blue moon, your followers are not going to take you seriously. They might think you’re too busy or, worse, not a thought-leader in the field. For this reason, having a content calendar is imperative. It doesn’t have to be anything fancy. All you need is a basic outline of when you’re going to create and publish your content. You’ll find that having this schedule will actually take a bit of the pressure off of you, and will ensure your readers and followers have a steady stream of useful content. If you think you’ve fallen prey to any of the mistakes we’ve mentioned above, why not give us a ring? Content marketing is arguably the best way to increase your followers and maintain them. However, keep in mind that it also requires careful planning, a commitment to being consistent, and the willingness to get to know what your community really wants. Our content creators at MO can guide you through this.